Jesus is ready to forgive everyone – both sinners (bad people) and self-righteous (good people). God is Father to all. This lesson shows children that God’s love has no limits and they are always welcome to come back to HIM. Learning Objective: After this lesson, children will demonstrate understanding that God wants to save everyone (both sinful people & self-righteous people). Learning Indicator: Test: Children will answer open-ended questions that show their comprehension. Setting: Sunday School or Children’s Church: This Bible lesson requires 25 minutes, but can be extended with additional activities suggested below. Explanation: In the parable of the prodigal son, Jesus was teaching that God wants to forgive both sinners and self-righteous people. The real focus of this story is the long suffering father, who continues to love both sons as they dishonor him. It is a beautiful story of God’s love and determination to see the lost return to him. Because of my teaching setting, I emphasized the message that “rule-keepers” and “good kids” need to be forgiven too. It is important to make the connection that the pride of self-righteous people needs forgiven just as much as the wild living of prodigals. Much of my thinking on this parable has been informed by the excellent book by Tim Keller called The Prodigal God. It is a book that explains God’s grace and Jesus’ parable of the prodigal son. Hook (Lesson Introduction): Call two adult helpers up to the front. Explain to the class that you are going to pretend these are two very different children. (Choose pretend names for them that no children present have.) If you have no helpers draw stick figure people on a marker board. Ask the children to make up different good and bad things these two different pretend children might do. After each suggestion, have the adult helpers act out that behavior. Here are some examples. Ask the children: Who do you want for a friend? Who does God like more? Say: Jesus liked to teach people that God really does love everyone, but many times the “church-people” would get upset and think they were better than the “sinners.” This is a story that Jesus told them to show that both kind of people need forgiveness and that God wants to save everyone. It’s a special kind of teaching story called a parable. The Father in the story shows us what God is like. The brothers in the story show us what we are like. The point is that God wants to save both people who follow the rules and people who break all the rules. In this Bible story, we’re going to hear about two brothers that seem very different, but really have a lot in common. We’re also going to hear about their dad who is keeps loving his children even when they treat him very badly. I want you to listen carefully to the way each brother treat the father and the way the father responds. 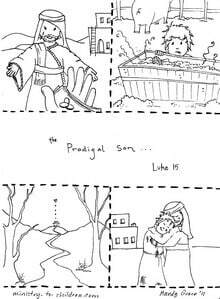 Read Luke 15:11-32: Be sure to engage the children with good story telling. Ask unscripted questions to clarify points in the story. The questions under “review” below are the key points for them to understand from the lesson, so be sure to emphasize them as you read. True / False Review: Ask the children to choose which of the following statements are correct. If the statement is correct they should stand, if it is false they should remain seated. How did this brother dishonor his father? How did the Father respond to this bad behavior? What do you think it would take to make the Father stop loving this Son? What do you think the Son will do next? Test: Call on volunteers to answer the following questions. Ask follow up questions to ensure they understand the objective of the lesson. Which brother do you think Jesus wants us to copy? Which brother do you think deserved to be forgiven by the Father? What does this the Father in this story show us about God? According to this story, what kind of people does God not love? How does God want you to feel about that person? Ask them to begin to pray for that person and to ask God to help them love that person better. Make a plan to do that tonight. Older kids might enjoy this animated music video based on Jesus’ parable of the Prodigal Son. It tells the story in a modern context with a young girl who goes astray. This could create some helpful conversations, especially with older elementary or middle school students. Tony Kummer (Editor) reviewed & updated this page on : April 1, 2019 at 6:01 pm. All our content is peer reviewed by our readers, simply leave a comment on any post suggest an update.